Amid a widening rift in the Chautala family, Dushyant Chautala said only the Indian National Lok Dal's national executive or a committee headed by the party president could take action against him. 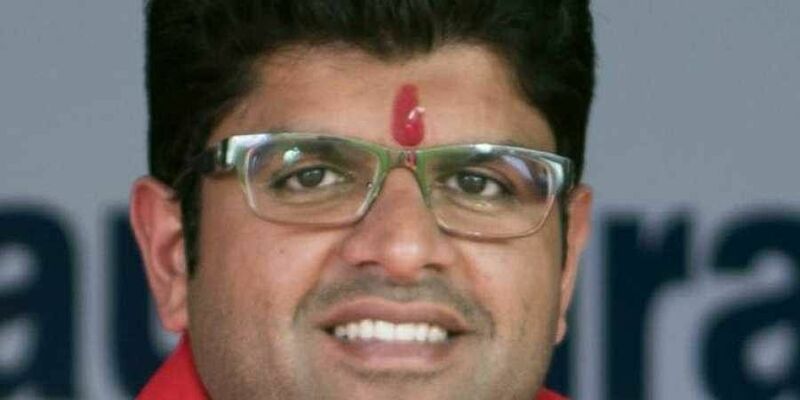 CHANDIGARH: Haryana MP Dushyant Chautala Saturday refused to accept his expulsion and that of his brother Digvijay Chautala from the INLD, claiming that the party's national executive had not met and no sack order issued by president Om Prakash Chautala. But he claimed the "working committee" meeting called by his father Ajay Singh Chautala on November 17 in Jind could suspend or expel any leader. "Definitely, if the committee unanimously takes action against anyone. It is supreme," he said, answering a question at his first press conference here after the crisis. The young Chautala claimed he heard about his "expulsion" only through the media. On November 2, an INLD press release quoting their grandfather Om Prakash Chautala had announced the expulsion of the two brothers following an inquiry which found them guilty of "indiscipline." "I do not believe that the decision on the suspension and expulsion was taken by Chautala sahib (Om Prakash Chautala)," Dushyant Chautala said. "Neither the suspension letter bore his signature, nor have I received my expulsion letter till now. As far as I know, there was no such letter signed by the national president," he added. "I do not accept that I am not in the INLD. Until I get a letter signed by the national president, I will not accept that I have been expelled," said the Hisar MP. Chautala claimed that under the INLD constitution, the INLD state executive was not empowered to expel him. "If any action can be taken against me, it is by the combined meeting of party's national executive or a committee under the leadership of the national president. Till now, no such process has been followed," he said. "Chautala sahib is the head of the family and the party chief, and if he issues orders in writing I will not challenge them and accept them as his blessings," he said. Dushyant Chautala said the report of the disciplinary committee, which earlier suspended him and his brother, was also prepared "behind closed doors." He said the INLD's committed workers will not tolerate it if "some people try to break or capture" the party. The party did not belong to "one person", but to each "soldier" of the INLD who had toiled to strengthen it, the MP said. "But some people are trying to throw us out of the party," he said, without taking names. He said the slogans raised by party's youth activists at the Gohana rally were wrongly considered hooliganism. "It was the enthusiasm and emotions of the youth activists. But some people did not like their emotions," he said. Dushyant Chautala suggested that he and his brother were "ignored" in the organisation of the Gohana rally. "There have been consistent efforts to keep us away from organisational activities," he said. "People who were working with Ajay Chautala were consistently humiliated at party meetings. It has been happening for over the last four years." "Being an MP, I raised important issues on the floor of the House in Parliament. But it is saddening to note that state-related issues like student elections which we raised through the media were not taken up in the Vidhan Sabha." Asked whether former Punjab chief minister Parkash Singh Badal had tried resolve the family feud, Chautala said, "He is the tallest leader and he has guided us in tough and happy times." "I, Digvijay and my father talked to Badal Sahib on the day after Diwali to seek his blessings," he said. Meanwhile, Ajay Chautala held a meeting of his supporters in Delhi on Saturday. "Abhay is dear to me and I will placate him," he reportedly said there.